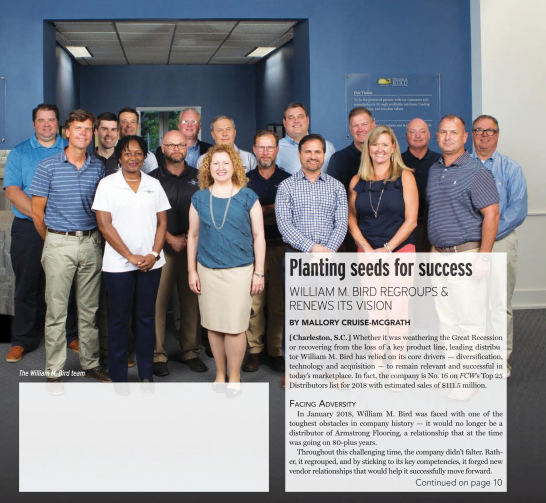 William M. Bird has enjoyed a long 153 year history. In that time, our company has been through changes, weathered challenges, and seen significant growth. We attribute our staying power to our commitment to “relationships and reliability” and our five core values. We were honored to be featured in four articles in Floor Covering Weekly’s NAFCD issue on November 6, 2018. The articles graciously outline our history, specifically the changes in our company this year. The future is bright, indeed! Thank you to our customers, manufacturing partners, and employees for your dedication and encouragement. We are grateful.